What a great Christmas gift! I found that Perfect Soup made the Holiday Gift Guide for the Smithsonian Magazine. And the best part? My best friend, Sara Akin, had her book, Three Scoops and a Fig featured, too! How cool is that? Hooray! Hooray! Hooray! I just signed the contract for my book Squirrel's Fun Day with Candlewick Press. This will be the sequel to Squirrel's World, and the wonderful Valerie Gorbachev will do the illustrations, again. I absolutely love writing about this character, and so I feel overwhelmingly blessed to be able to add the next book in Squirrel's adventures. Hope everyone is staying cozy and warm. And I wish everyone the brightest, merriest Christmas. May God's peace envelope you and bring you great joy. Great news! 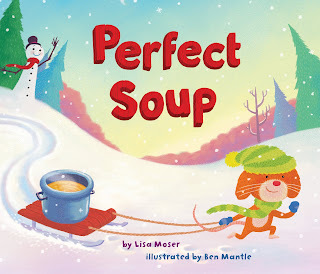 My new picture book Perfect Soup (illus. Ben Mantle, Random House) was released today. I'm so excited because I absolutely love how this book turned out. Murray the mouse likes everything perfect- especially his soup. So when Murray discovers he's missing a carrot for Perfect Soup, he sets out to get one. But getting a carrot isn't as easy as it seems. The farmer wants him to haul wood. The horse wants bells to feel fancy, and that's just the beginning of the list Murray must fulfill. Just when things are bleakest, Snowman gives him a gift without asking for anything in return, and Murray discovers that friendship is much more important than perfection. Ben Mantle did an extraordinary job with the illustrations, adding exquisite color and detail on every page. Every single time I read it-and I've read it a lot, believe me-I find something new and exciting in the pictures. One time, I'll follow the little bird throughout the story. Another time, I looked at how Murray's hat mimics his mood-enthusiastic, downtrodden, and surprised. I love to look inside the houses to see what kinds of things are in Murray's kitchen, Mrs. Wooly's teapot-shaped house, and so much more. Every turning of the page is an illustrated treasure. I feel such gratitude for all the blessings that come with each book- the joy of writing it, the tremendous appreciation for the artist and illustrations, my wonderful, wonderful editor, the bookstores and libraries who will put it on their shelves, and the children and adults who will read it and hopefully laugh along with it. I thank God and Jesus for this dream come true! I am so excited about presenting my program "Just Like You" at the Sheboygan Children's Book Festival. Through a Power Point presentation, I will talk about my stories, how I get my ideas, and how my writing process exactly mirrors the way children write at school. This program is geared for elementary students, parents, and anyone wanting to write for children. So, please, come and join me at the Mead Public Library in Sheboygan, Wisconsin from 1:30-2:30 in the Story Garden. Also, please check out all of the wonderful authors attending and presenting at the Sheboygan Children's Book Festival. Their website is http://www.sheboyganchildrensbookfestival.org/ Come, listen, and learn from children's writers Avi, Keiko Kasza, Renae Graef, JoAnn Macken, and many others. What could make it even better? It's FREE! Let's all gather for a literary event that everyone will celebrate. I'm always amazed at God's gifts. They seem to come at just the right time and in just the right way. I've been struggling with writer's block for quite a while, now. Maybe 9 months, minus the 2 1/2 months I take off during the summer. I just could not, could not, could not generate any new story ideas. 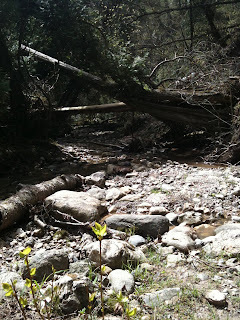 Even the older stuff I was working on seemed to be mired in a standstill traffic jam. And worse. . . I wasn't finding any joy when I wrote. Just this terrible pressure to produce. It doesn't get any worse for a writer. So, I found myself praying to God and Jesus to let me find the joy again. I always pray as I write asking for Them to let me bring goodness to children through my stories. But I found myself needing the goodness from the writing. And hours after the prayer, I found the gift. A story- fresh, new, never pondered before- opened up right before me. And there was joy. Thank you, God and Jesus, for hearing us, leading us on when we are tired and joyless, helping us find the way. Daydreaming is an essential component to the writing process. And yet, I bet it is easily the most misunderstood. Today, I stared out my sunroom window for almost 3 hours. I didn't write one word in my notebook. I didn't revise an old story. And yet, I worked. I let my mind travel unhindered in ten different directions. I let old and new characters play like a movie in my head. I let images drift in and out. I daydreamed. Daydreams are funny little things. The slightest thing will trigger them. And then the mind takes off. For instance, I saw a crow fly at our big, plate glass window and peck at it in a menacing way. Then he flew off to join his friends, maybe bragging about what he had done. And here is my train of thought on seeing this event. -What in the world is that crow doing? -Could he actually chip the glass in the window by pecking at it so hard? -What are his friends over there thinking while he does this? -What do crow's nests look like? -Do they weave them out of soft little bits like the songbirds' nests I've seen? -What would happen this crow found a bit of bright yarn? -What if it wasn't a crow that found the yarn, but someone else? -What could yarn be used for? And then I was off the races. A darling little start to a story formed. All because I daydreamed. So, fellow writers, allow the time for the hard work. Daydream. The beautiful thing about being an author is that your office is portable. 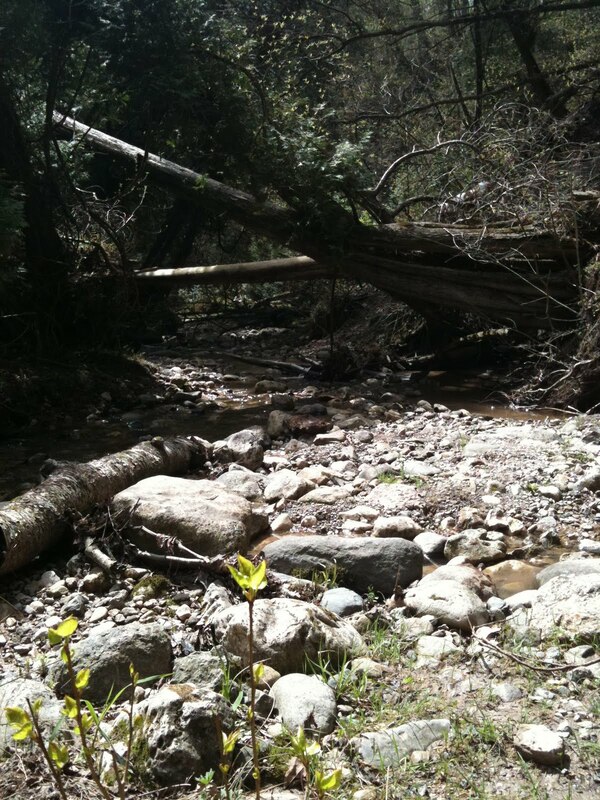 My favorite place to write is outside- by a pond, by this stream. There's something about a cool breeze and fresh air that opens up the doors of creativity. Ideas seem to bubble up from the springs and sprout like apples on the trees. Next time you're looking for a really good idea, try going outside, sitting quietly with pen in hand. You'll have the world's best office, too. I just took the giant leap onto Facebook. So, please join me on Facebook at Lisa Moser Books. I am absolutely thrilled to announce that I just sold my picture book Railroad Hank to Random House Books for Children! Railroad Hank was just a terrifically funny character to write about, and I've always been enthralled with trains. Put those two elements together, and it was true joy in the creation process. As always, I'm feeling so thankful and blessed that I continue on this journey as a children's author. This time by train! So, thanks to God for such happiness.